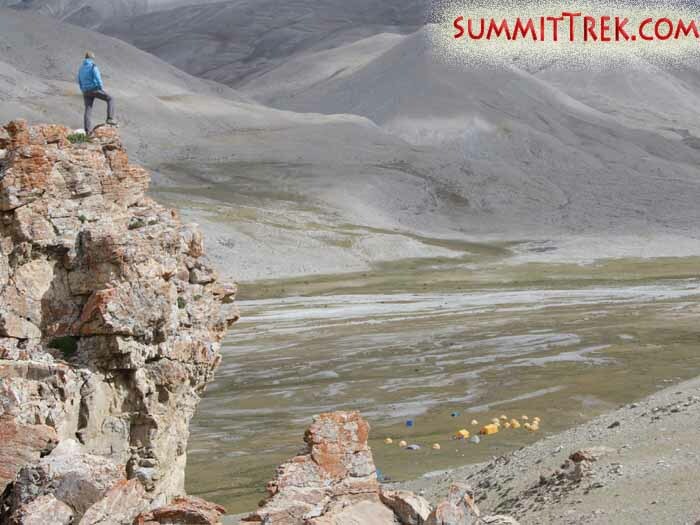 Our Autumn 2009 Shishapangma expedition is also currently climbing in Tibet. Please click here to read dispatches and see recent photos from the mountain. Hello SummitClimb news. 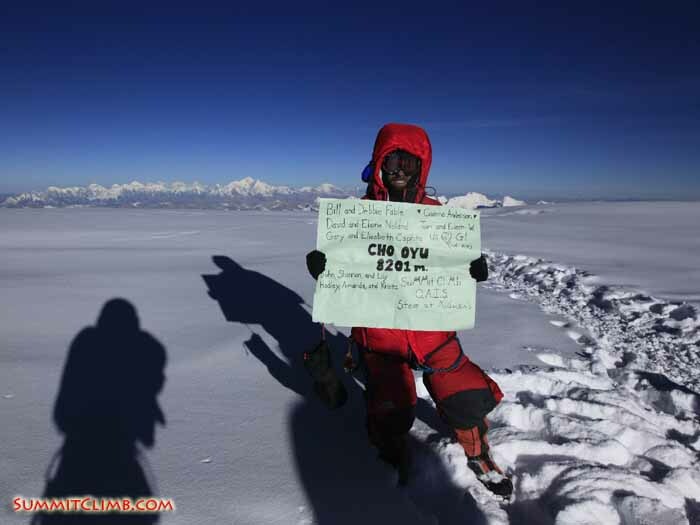 This is Arnold Coster, the leader of the SummitClimb Cho Oyu expedition, calling from ABC at 5750 metres/18,900 feet and today is the 29th of September. Everybody came safely down the mountain and also all of our gear is back down in ABC. Our yaks are waiting to bring our gear down tomorrow to interim camp, so we can reach the Chinese/Nepalese border tomorrow. Everything is going very fast and we’re finishing this expedition now. The team is in good health. Everybody is doing great and the spirits are still very high. This was a great group to climb with. I have a more detailed list of the summits. All of our summits were on the 27th of September and the times I’m giving are Chinese time. The first member on the summit was Ridlon Kiphart at 8:20 a.m. 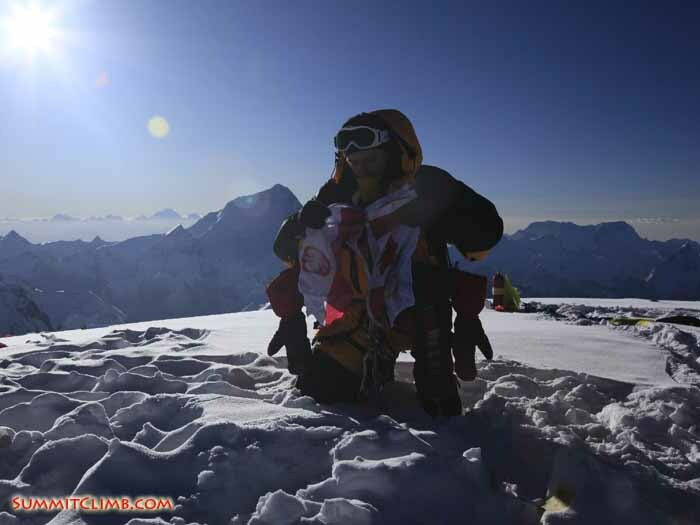 The next one was Adam Dixon and Ry Fable at 8:30 a.m., together with Jangbu Sherpa and Thile Sherpa. Arnold Coster reached the summit at 8:35 a.m., together with Stephen Marsh. 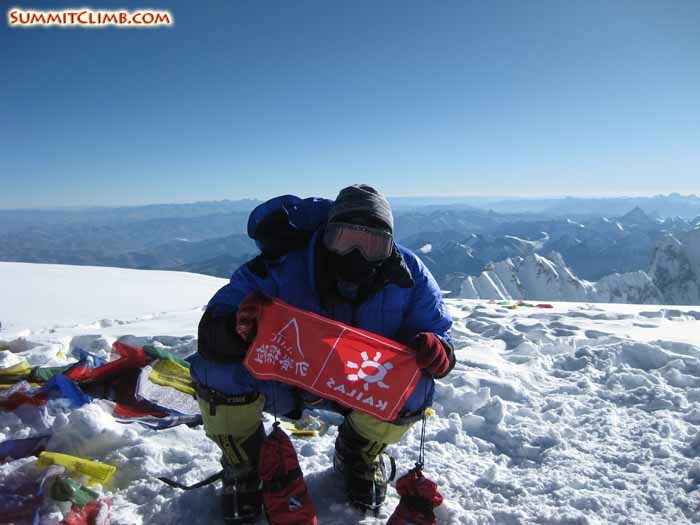 Wiktor Mazur reached the summit at 8:40 a.m., together with small Jangbu Sherpa. Scott Patch reached the summit at 9:20 a.m. Eric Plantenberg reached the summit at 9:25 a.m., together with our Chinese climber, Asu, at 9:30 a.m. The last one on the summit was Gavin Vickers at 10:20 a.m., who did a great push and climbed all the way without oxygen. 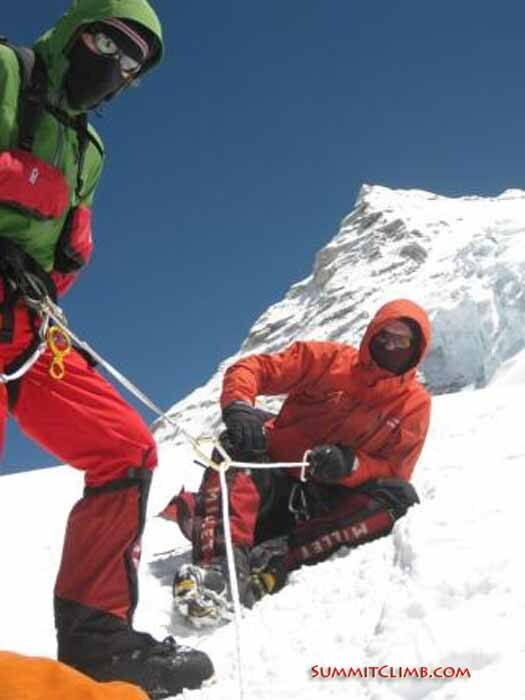 Robert Schulze made it up to 7700 metres/25,250 feet and turned around 2 rope lengths above the Yellow Band. He made a very good try, but unfortunately he didn’t make it. 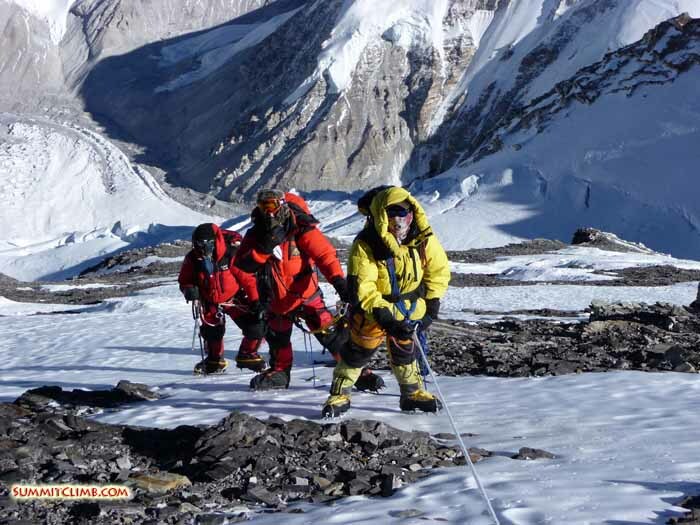 He was together with Lhakpa Sherpa and they descended back down to camp 3. Cho Oyu summit photos: Adam Dixon. Asu, our awesome high altitude staff Chinese climber. Eric Plantenberg and Scott Patch. Gavin Vickers (Arnold Coster). Team summits! Back safe in the high camps. Hello SummitClimb news. This is Arnold Coster, the leader of the SummitClimb Cho Oyu expedition, calling from camp 1 at 6400 metres/21,000 feet and today is Sunday the 27th of September. Robert didn’t reach the summit. He turned around after the Yellow Band at about 7800 metres/25,600 feet. He made a great effort and did very well. The summit weather was almost perfect. It was cold at 1:30 p.m., but no wind at all. The views were crystal clear. It makes you feel very small when you stand on top of this big mountain. Now most members are sleeping in camp 2 at 7100 metres/23,300 feet. Some members are here with me at 6400 metres/21,000 feet. Tomorrow everybody will come down to ABC for some real food, good rest, and maybe some beer. Cho Oyu summit photos: Ridlon Kiphart. Ry Fable. Wiktor Mazur (Arnold Coster). Hello SummitClimb news. This is Arnold Coster, the leader of the SummitClimb Cho Oyu expedition, calling from camp 3 at 7500 metres/24,600 feet and today is Saturday the 26th of September. After a snowy night in camp 2 we had an easy start. We had to dry out all our sleeping bags and clean up a bit before we could go up to camp 3. Yesterday we walked in the snow all day and today it was very hot walking up to camp 3. What a big difference! Everybody made it to camp 3 in good time and we’re all in our tents. We are sharing 3 people to a tent, which is kind of crowded, but normal for a summit push. We’re cooking soup, drinking tea, and some people are breathing some oxygen so they get strong for the summit push. The plan is to leave tonight at 1:30 a.m. Chinese time to set out for the summit. The weather is very calm with no clouds and no wind, so let’s hope that it stays like this. Below camp 3. Above camp 3 (Stefanos Voutselas). Hello SummitClimb news. This is Arnold, the leader of the SummitClimb Cho Oyu expedition, calling from camp 2 at 7100 metres/23,300 feet and today is the 25th of September. Today was a hard day for most members. Although we have been to this altitude before, I think the length of the climb is taking its toll, but everybody made it to camp 2 healthy. We’re all drinking, eating and getting strong for the next day. The plan is to climb to camp 3 tomorrow at about 7500 metres/24,600 feet, but we’re only going to stay there for a few hours. We’ll probably leave camp 3 at midnight or 1:00 a.m. Chinese time for our summit attempt. Right now the weather is a little bit snowy and cold, but the forecast says it should stop snowing tomorrow morning. I think we have a very good chance of a nice summit. Climbing up towards the summit (Stefanos Voutselas). Hello SummitClimb news. 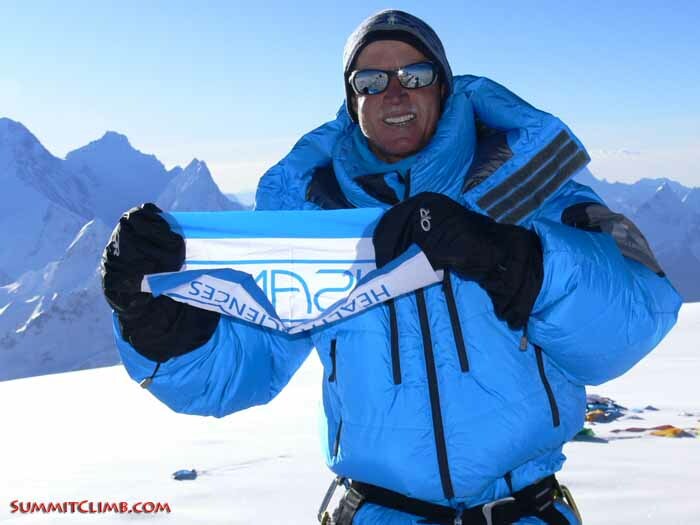 This is Arnold, the leader of the SummitClimb Cho Oyu expedition, calling from ABC and today is the 24th of September. After the final check with the weather forecast today, we decided to go for the summit push. The weather looks good up until the 27th of September. All of our members left for camp 1 after lunch. Samdien, our cook, prepared a very delicious lunch again to get us going and all of the members starting heading up. Tonight everybody will sleep at 6400 metres/21,000 feet in camp 1. The following day on the 25th we will sleep in camp 2 at 7100 metres/23,300 feet. 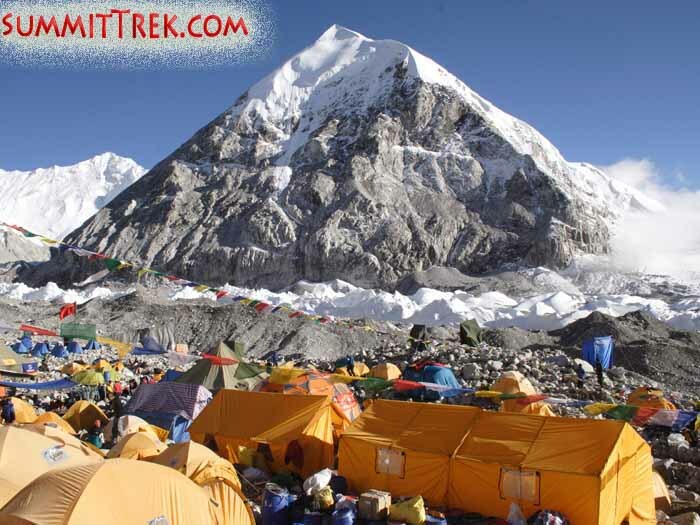 On the 26th we will reach camp 3 for the first time at about 7500 metres/24,600 feet. 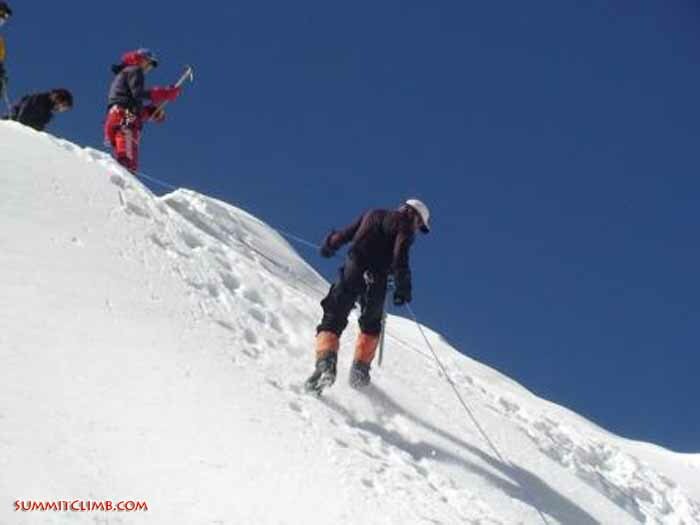 We’ll probably set off in the middle of the night at 1:00 a.m. (Chinese time) on the 27th and go for the summit push. All members will be back at around 1:00 or 2:00 p.m. in camp 3 on summit day. So I hope the good weather stays. We were afraid to wait any longer and decided to just go for it because the weather looks good now. Camp 2 at 7100 metres/23,300 feet. Life in the high camps. Going up the ice-wall to camp 2 (Arnold Coster). 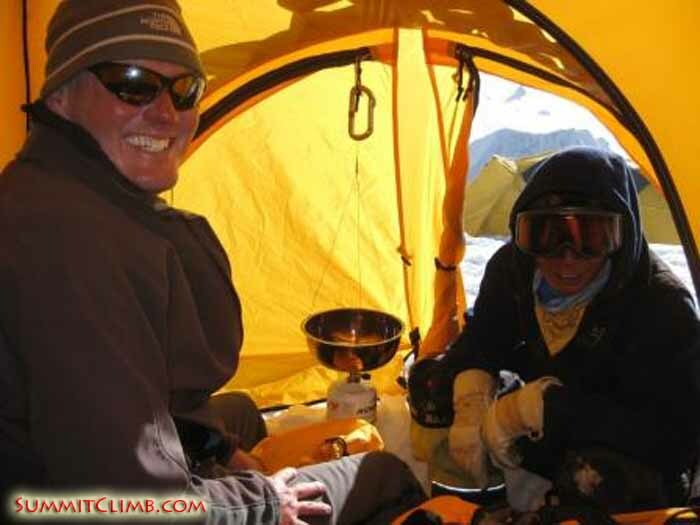 Hello, this is Carin Kiphart with a dispatch for the SummitClimb Cho Oyu expedition on 22 September, 2009. It’s nearing the end of my last day here at advanced basecamp as I get ready to head back to Kathmandu. So I offer thoughts as the only trekker and female of the group. I decided to join this expedition right before it was commencing to better understand the world of mountaineering and see 2 new countries. What I got was that and much more. I felt that I was in the midst of one big international expedition here at advanced basecamp. There are groups from all over the world. Some teams are attempting to put up a new route, while other climbers are getting ready to summit on the normal route. All along the path you can hear everything from Portuguese to German to Dutch. Everyone is quite friendly since the goals are all the same, to summit. I now have a better understanding of what the climber’s experience is, alternating from hard climbing days on ice-falls to rest days in advanced basecamp washing clothes and preparing for the next trip up the mountain. I watched the team stagger back into camp after spending 2 nights at high altitude, exhausted, but triumphant, staring longingly up at the summit. Having the opportunity to just be in the presence of this greatest of mountain ranges has been inspirational for me as a writer and adventurer. As I get ready to trek down the mountain tomorrow I will leave with fond memories of the team, experience and the mighty Himalaya, one of the greatest ranges on Earth. My expectations have been exceeded greatly. Camp 2 at 7,000 metres/23,000 feet (Guntis Brands). Dear friends and family, this is Ry Fable calling in a dispatch for the SummitClimb Cho Oyu expedition for September 21st, 2009. 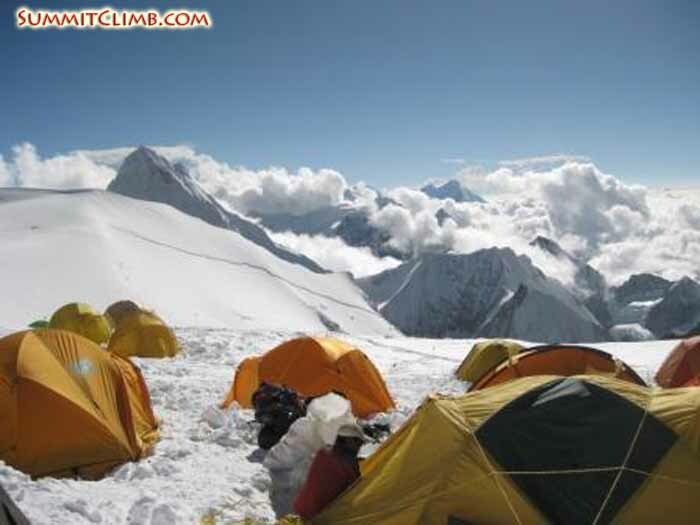 Most of the climbers made it to camp 2 at 7100 metres/23,300 feet. We had a cold night’s sleep with temperatures around -20 Celsius. After waking, most climbers began the laborious process of melting snow to make water. 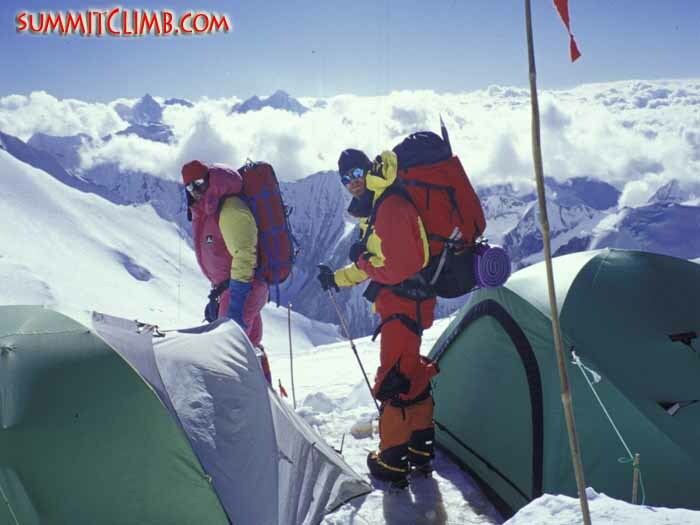 Adam Dixon and Gavin Vickers climbed above camp 2. 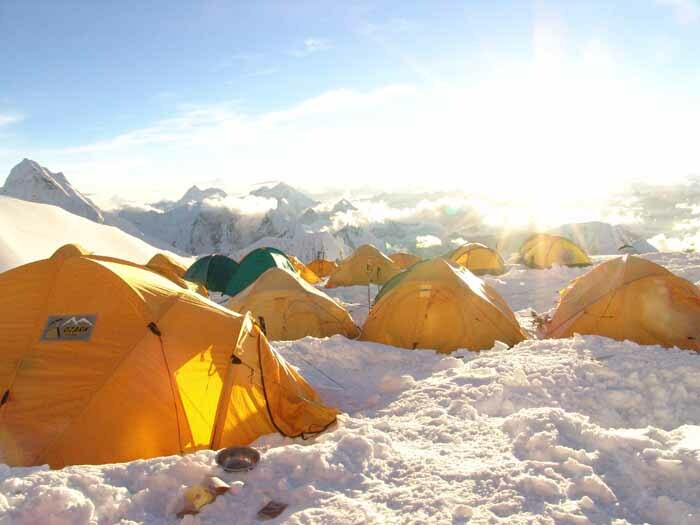 The rest of the team descended to camp 1 as the sun peaked over the mountain at 10:30 a.m. The descent to camp 1 was uneventful except for a few inexperienced climbers from other teams having trouble at the ice-wall abseil. After a brief stop in camp 1 to stash gear, make water, and take a break, the team proceeded to ABC for some delicious food and much needed rest. Hello this is Wiktor Mazur for the SummitClimb autumn Cho Oyu expedition. I’m calling in a dispatch for 20 September from camp 2 at 7100 metres/23,300 feet. All but 3 of our group have arrived in camp 2 and we plan to spend the night here in our comfortable sleeping tents. For most people, including myself, this is a new altitude record. It is with a lot of satisfaction we look back on the long day we had getting up here to camp 2. It took us about 9 hours to reach this height. Team members at camp 2 at 7100 metres/23,300 feet (David Lepagne). Hello SummitClimb news. This is Arnold, the leader of the SummitClimb Cho Oyu expedition, calling from camp 1 at 6400 metres/21,000 feet and today is the 19th of September. Tomorrow we plan to go up to camp 2 at 7000 metres/23,000 feet. It’s going to be a lot more difficult climbing tomorrow because we have to carry some rope, our down suits, sleeping bags, and some food because we’re going to need that next time we go up there for our summit attempt. Ridlon went to intermediate camp to recover from a headache. I just spoke to him on the radio and he’s doing fine and back in ABC. He wants to come up to camp 1 tomorrow. 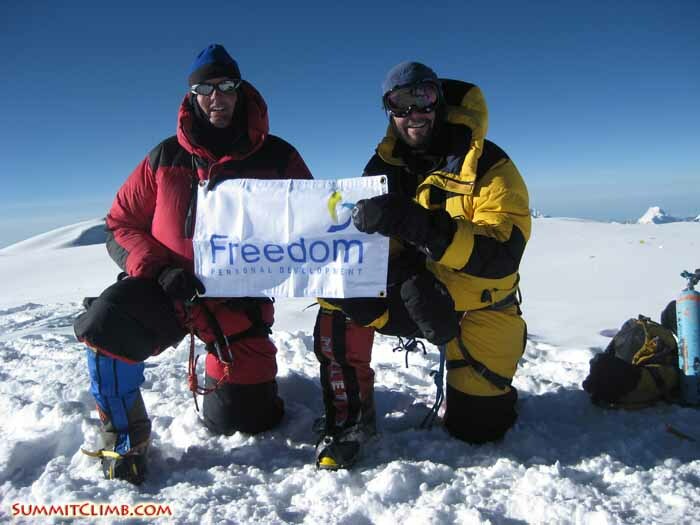 One of our sherpas is going to go to ABC to climb with Ridlon to camp 1, while we’re going to camp 2. Right now we’re enjoying our food in camp 1 and getting ready to go to sleep. I’m here with my Chinese friend, Asu, in the tents. Asu even carried some hamburger up to camp 1, so I think it’s pretty amazing what we’re eating high up in the Himalaya. Team climbing above camp 1 up the fixed lines (Arnold Coster). This is Scott Patch giving the SummitClimb Cho Oyu autumn update for the 17th of September. Today we woke at camp 1 to milk tea and porridge. We all had much less sleep at this elevation and a bit of a cough or some ailment, but we’re all doing well. 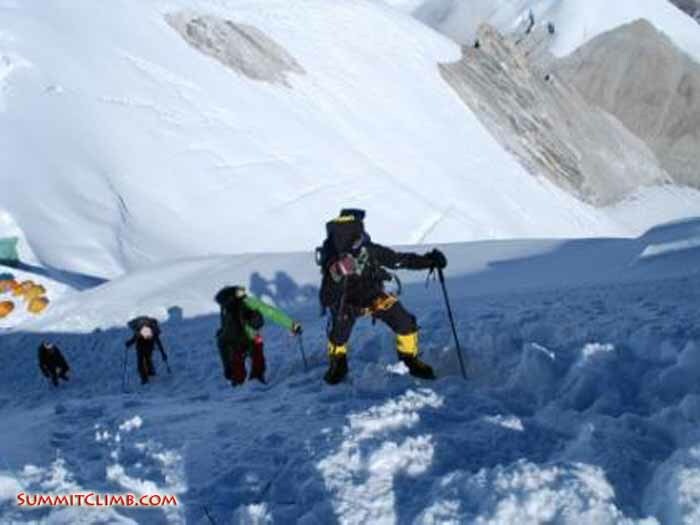 Most of the team continued on above camp 1 to climb above the ice-wall before returning to advanced basecamp. The ice-wall is one of two big cruxes of the route, being a 30 metre icy climb. We rappelled down the face of the wall after scaling it. The elevation we made it to today was 6800 metres/22,300 feet. The team members that made the climb were Adam from the UK, Ry from the US, Gavin from Australia, Wiktor from Canada, Eric from the US, Asu from China, Arnold from the Netherlands, and me from the US. Team members taking a break on the fixed lines (Arnold Coster). Hello SummitClimb news. This is Arnold, the leader of the SummitClimb Cho Oyu expedition, calling from camp 1 at 6400 metres/21,000 feet and today is Wednesday, the 16th of September. All of the members did great climbing up to camp 1. Everybody made it in good time, good health and spirit. The sherpas did a great job pitching our camp. We didn’t have to do anything, as everything was set up for us already, so it was easy mountaineering. Christian, our German member, decided to turn around because he was not feeling too good from the altitude, so he went back to ABC to rest a little bit more. He’ll try to catch up with us later. 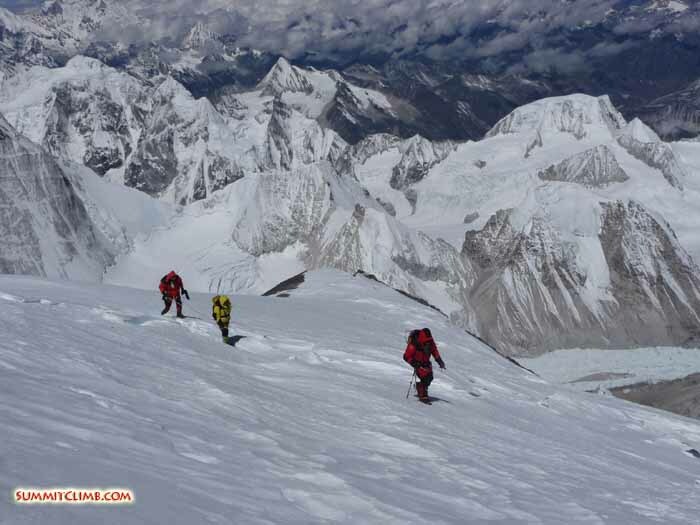 Tomorrow our team members will try to climb as high as possible and then all back down to ABC. We have to climb up and down a lot because our bodies are not yet used to the altitude and it is very hard for us to rest high up on the mountain. The longer we stay up, the weaker we get. That’s why we climb up and then go down to sleep and eat so we get strong again for the next push. Every time we push to go up we try to go a little bit higher. Our sherpas will go to camp 2 again tomorrow to put up some more tents, bring some more gas and food. 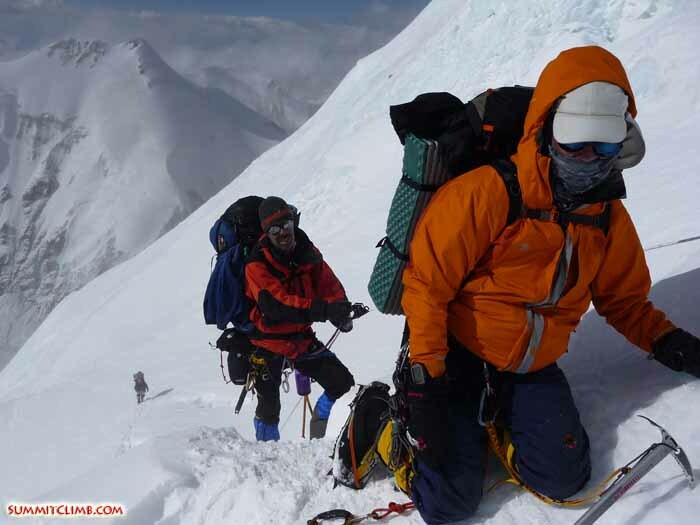 Without our awesome sherpas these expeditions would be much more difficult. One of our sherpas joined the group who is fixing the route, which means they are going to try to fix all the ropes to the summit ridge tomorrow during the day time. That is great because the fixed rope is our safety line. It’s very dangerous to do the climb roped together. That’s why we used fixed lines, so it’s easy to go up and down and you don’t have to use the same rope in the same place all of the time. This is Camp 1 at 6,400 metres/21,000 feet. It is possible to walk to this camp in a sturdy pair of leather trekking boots with good ankle support. 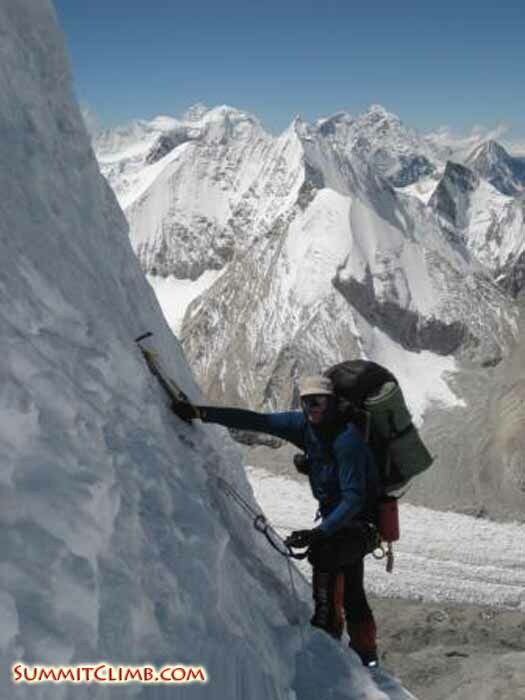 Usually, no crampons are necessary to reach camp 1 (David Lepagne). Hello SummitClimb news. This is Arnold, the leader of the SummitClimb Cho Oyu expedition, calling from advanced basecamp and today’s date is the 14th of September. Today all of our members climbed to camp 1 at 6400 metres/21,000 feet and everybody did very well. Everybody made it within 4 hours, so I think we have a very strong, motivated group and they will do well going up to the next camp. Also, we brought about 500 kg of gear to camp 1, so we have a good stash of supplies now to make camp 2 and camp 3 in the next couple of days. Tomorrow all members will rest in ABC to do small things like laundry and washing before we go up to camp 1 again this week. The plan is that we are going to sleep in camp 1 on the 16th. 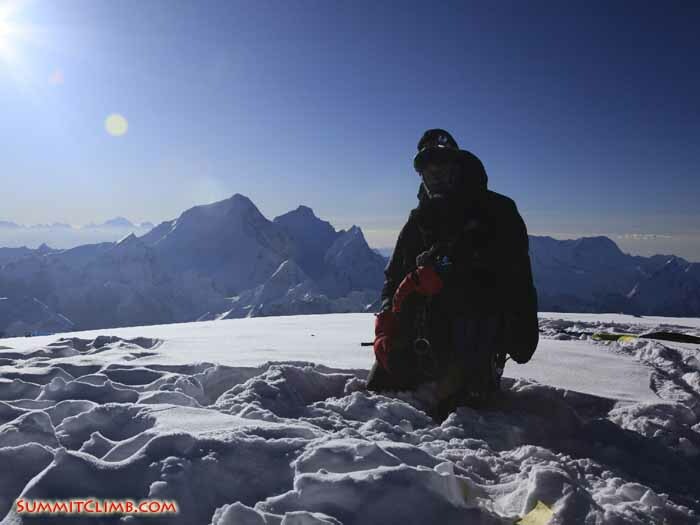 This is Eric Plantenberg with a SummitClimb dispatch for Cho Oyu on the 13th of September. This is our 3rd morning at advanced basecamp. We awoke to clear skies and slightly colder temperatures. The low in my tent last night was -5 Celsius until the sun started coming up at around 9:15 a.m., when the temperatures jumped into the low teens. Today was a very special day for us at advanced basecamp, as the Tibetan and sherpa members of our team performed a ‘puja’. A ‘puja’ is a Buddhist ceremony where a stone chorten was erected and Buddhist prayer flags were streamed throughout our entire camp. We then placed our climbing boots, crampons, and equipment around the chorten, asking for the mountain’s blessings for everyone to have a safe expedition as we climb higher up on the mountain. Our team conducting some rope training above ABC (Arnold Coster). 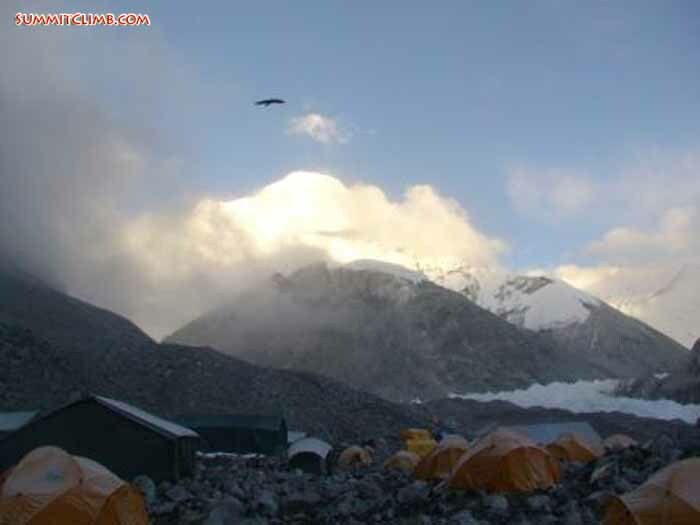 Hello to all from advanced basecamp on Cho Oyu, Tibet. This is James Wilde calling in on the 12th of September. The weather has been good except for some light rain and snow showers. The views of Cho Oyu, surrounding mountains and glaciers were phenomenal today. We went ahead with plans and practiced on the fixed lines using ascenders, rappelling and making sure everyone is set for going further up on the mountain. It was good times. We took a lot of photos and video, which we’ll try to send in as soon as possible to post. Our comfortable advanced basecamp, located at 5700 metres/18,700 feet (Arnold Coster). Today we had our first full day in ABC at 5750 metres/18,900 feet. Most members spent their day getting settled in their tents. After all, this is our home for the next month! I think we have a great ABC with all the comforts we need. Every member has their own tent, as well as the team’s large dining tent, kitchen tent, storage tent, toilet tent and even a shower tent. ABC is like a small village. 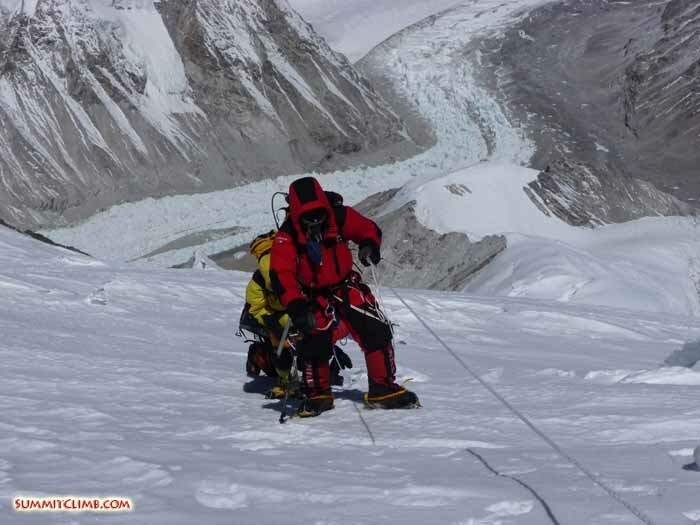 Tomorrow all sherpas from all teams will have a meeting about fixing the ropes to the summit of Cho Oyu. Our team will have a rope practice to go over all the rope techniques again to make sure everybody can travel safely on the mountain. Sunday we will have our ‘puja’ ceremony. In this Buddhist ceremony we ask the mountain god for safe passage, but it's also a social gathering and helps breaks the barrier between staff and members, so we all feel like a unified team. I think we have a very strong team with high spirits. Hello SummitClimb news. 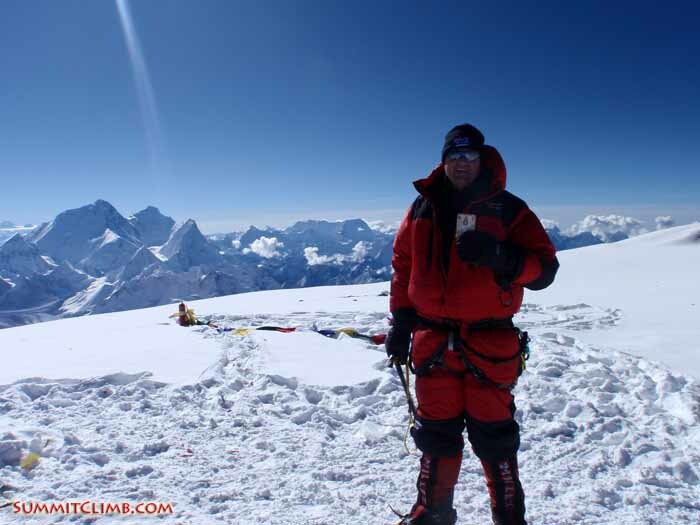 This is Arnold Coster, the leader of the SummitClimb Cho Oyu expedition calling from advanced base camp at 5760 metres/18,900 feet and today is the 10th of September. We made it to ABC today. It was a long day for most members and also for the yaks. We left early this morning from interim camp and some of the yaks didn’t arrive in ABC until 5:00 in the afternoon, which created a bit of difficulty because those yaks were carrying our kitchen equipment. All are members had to wait until they arrived to melt water and get dinner, but everybody is doing fine now and our cook managed to make a very good meal late in the evening. Tomorrow we are just going to relax, make ourselves more comfortable in ABC, put up and use the shower tent, and make our camp really nice. The day after we are going to do our ‘puja’ blessing ceremony because our sherpas won’t go up on the mountain until it has been performed for the team and all of our equipment. Then we’re going to do some rope practice and a bit of training. Our comfortable advanced basecamp, located at 5760 metres/18,900 feet (Samuli Mansikka). Hello SummitClimb news. This is Arnold Coster, the leader of the SummitClimb Cho Oyu expedition calling from intermediate camp at 5380 metres/17,600 feet and today is the 9th of September. We spent the morning organizing and weighing our equipment for the yaks. In total we had to bring out 3600 kg/7900 pounds of equipment and we had to load 60 yaks to get here, so we were busy with that all morning. All of the members hiked up here to intermediate camp pretty fast and everybody is doing great and all healthy. We will wake up early tomorrow and continue our journey to ABC at about 5800/19,000 feet. After tomorrow we can finally settle in one place. ABC is going to be our home for the next 3 weeks. I heard we already have good spot at ABC, so no worries about that. Everybody is healthy and we’re just relaxing. Samdien, our Tibetan cook, made a delicious meal for us tonight, which was great. So, everybody is strong and eager to go up tomorrow. Hi, this is Eric Plantenberg calling in an update for the SummitClimb Cho Oyu expedition for 8 September from basecamp. We had a fantastic time at basecamp today acclimating. Our activities included waking up and preparing equipment for heading to intermediate camp. After intermediate we’re going to be going on to advanced basecamp. Most of the team went on day hikes today, climbing anywhere from 300 to 600 metres, getting their bodies ready. Everybody is acclimating well. In the afternoon we practiced some training with the Gamow Bag in case of medical emergencies later on in the trip. Everyone is prepared and feeling great. Hi, this is Carin Kiphart calling in for the SummitClimb autumn Cho Oyu expedition for 7 September. The team was in high spirits as we left Tingri in some drizzling rain. This left us all wondering what majestic peaks towered above. Our amazing sherpa staff had basecamp prepared and lunch ready when we arrived. A hearty meal of curried beef, rice, salad, fresh veggies and smiling faces satisfied us all. The afternoon was spent getting used to our new elevation at 4900 metres/16,000 feet. For some that meant a nap, while others, a short hike. We kept our eyes on the sky as evening approached. Blue skies began to show through and the snowbound peaks 1000s of metres above showed us glimpses of their magnificence. For many on the team, this brief preview of Cho Oyu revealed the enormity of the thrill of what lies ahead. Today we left Tingri and drove to Cho Oyu Chinese basecamp. This is just a 2 hour drive from Tingri, located on a riverbank at 4918 metres/16,100 feet. 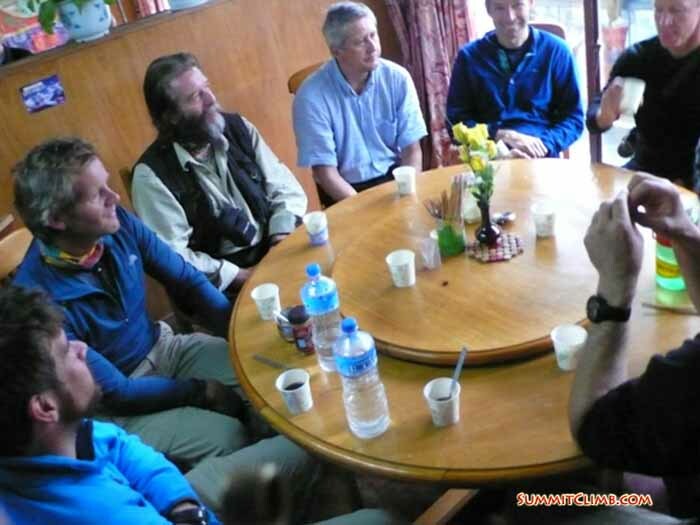 When we arrived at basecamp, it was already set up by our awesome staff and we were welcomed with hot tea and coffee. After this Samdien, our Tibetan cook, prepared a delicious meal for us. It was a welcome change from all of the food we ate on the road to get here. Some members spent their afternoon doing a small hike, while others just relaxed in basecamp. Our yaks, the animals that are going to carry our equipment up to ABC (advanced basecamp), will arrive tommorow evening. This means we will probably leave BC on the 9th and move up higher on the mountain. All members are doing very well, they are all healthy and strong. 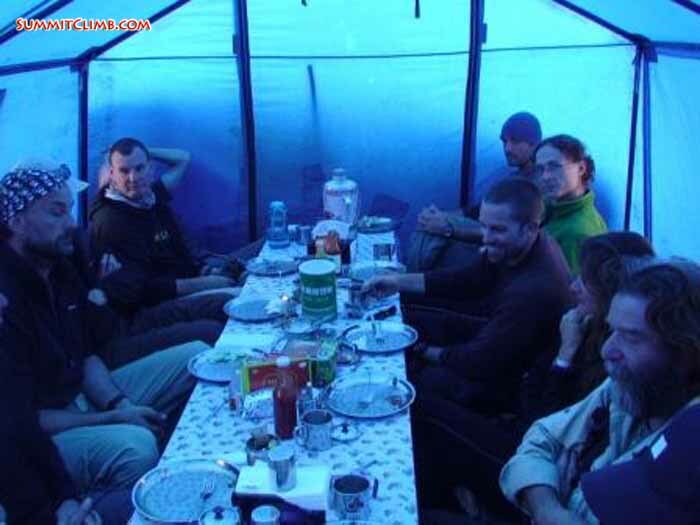 Our team eating a delicious meal in our comfortable basecamp dining tent. 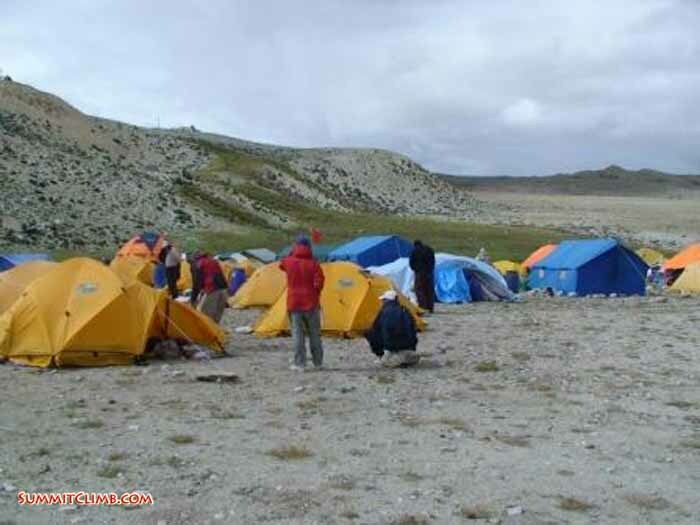 A view of Chinese base camp (Arnold Coster). 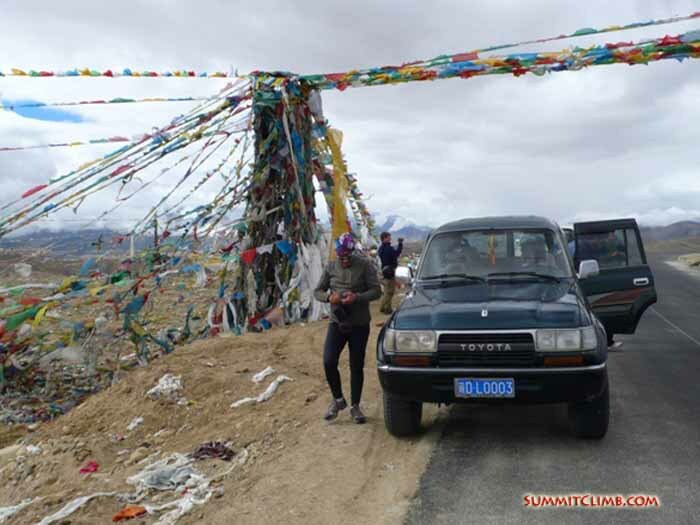 Yesterday we left Nylam for our journey further up the Tibetan Plateau. Our goal was Tingri, a small Tibetan village at 4300 metres/14,000 feet. The road was in very good condition, almost paved all the way. Just one year ago there was no cover on the road and it was all dirt. Tibet is changing very fast! On the way we drove across a high mountain pas at 5050 metres/16,600 feet. Unfortunately, we did not have a good view. The monsoon is still there, so there are clouds every day. We all arrived in Tingri at lunch time and enjoyed the nice Chinese food they prepared for us. In the afternoon we just walked in the village and enjoyed being out here. Our staff did a lot off last minute supply shopping for meat, fuel, some veggies etc. This is the last place of civilization before we reach our base camps. Tomorrow the Shishapangma and Cho Oyu team will split up and the dispatches will come from the two different teams afterwards. 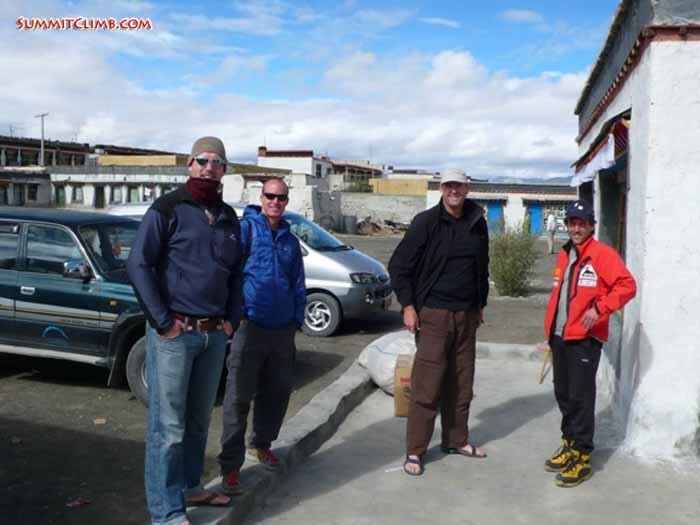 Arnold, Ridlon, Gavin and Jaimie hanging out in front of the TMA restaurant in Tingri.H aris and our team land-cruiser atop the 5050 metre Yakri Shong La Pass. Relaxing round the table in Nyalam. Richard, Bart, Robert, Steven, Christian, and Ridlon Dan Mazur). We left Kathmandu 12:00 p.m. at night for a bumpy ride to the Tibetan border. All members tried to sleep as much as they could, but on a bumpy road like this it's not easy. At 5:00 a.m. in the morning we couldn't drive any further. A big landslide blocked the road and we had to wait, so we had a different bus meet us on the other side. Finally the other bus showed up and we could drive to Kodari to have breakfast. At the Chinese border it was the same procedure as usual, with lots of waiting! First you have to exit Nepal, fill a lot of forms and then enter China. They will x-ray your luggage, search it and x-ray it again. It took us a couple hours to get this done. In Zhangmu, the first town in China, there was a well prepared delicious lunch waiting for us. After hanging around for a couple hours we finally got the green light to continue the trip to Nylam, our final destination for two nights. 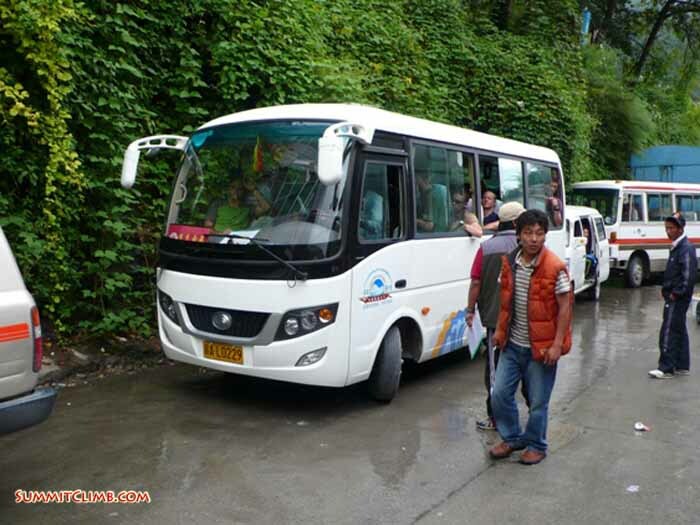 There is road work going on between Zhangmu and Nylam, which is why the road is only open a couple of hours per day. On an expedition you need a lot of patience to reach your destination. Nylam is a small mountain town at 3750 metres/12,300 feet with some simple hotels and basic shops. It’s a nice place for last minute shopping and scenic hiking around town. Today we went for a hike in the surrounding hills to get better acclimatized. We reached about 4000 metres/13,100 feet, which is very good. It will make our drive to Tingri at 4300 metres/14,000 feet a lot easier tomorrow. 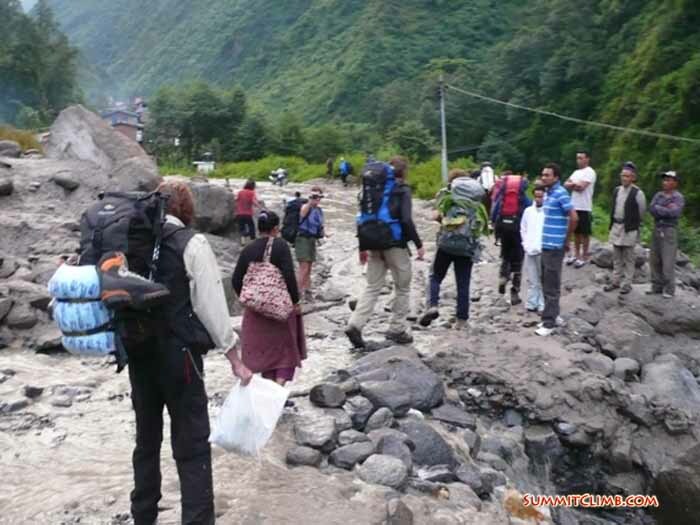 Crossing the washout on foot near Tatopani. Finally we reached Zhangmu in Tibet and boarded our bus. Let's go (Dan Mazur). Today started with a delicious breakfast specially prepared for our team meeting at the Beijing Hotel. We had a group orientation and all members were in attendance. We reviewed the procedures for our expedition and the philosophy which we plan to use in climbing www.ChoOyuClimb.com and www.ShishapangmaExpedition.com . It was a nice meeting, and fun to have all of the members together at one table. Everyone seems nice and I think we have a great team. We plan to leave early tomorrow morning, at 4:00 a.m.
Well we started out today at 6am and climbed up to Kathmandu's sacred and beautiful monkey temple. The views were stunning and the air, pollution free. 10 monks chanted a low throated murmur in front of a massive table of shimmering butter lamps and we felt the heat radiating off of the butter lamp table searing our cheeks. Local men and women walked to the top of the temple to sit cross legged on mats then sang and played musical instruments harmoniously. Pigeons circled the enormous gold white stupa and the beating of their wings punctuated the morning with a thumping percussion and a light dusting of airborne feathers. We walked down the back side of the temple, watched suspiciously by monkey families munching fruit clutched in tiny hands. Suddenly rounding a corner, we found refuge in the quiet garden of a five-star hotel and enjoyed an amazing breakfast of fresh local foods while seated in comfortable rattan armchairs on a raised dais while a few mosquitoes hummed lazily under a canopy of palm and grapefruit trees. Back at the hotel, we plunged into our duties of packing the medical kits, sorting and packing the high altitude food, and then the www.LeaderIntraining.com members began the careful task of checking each member's kit very thoroughly. 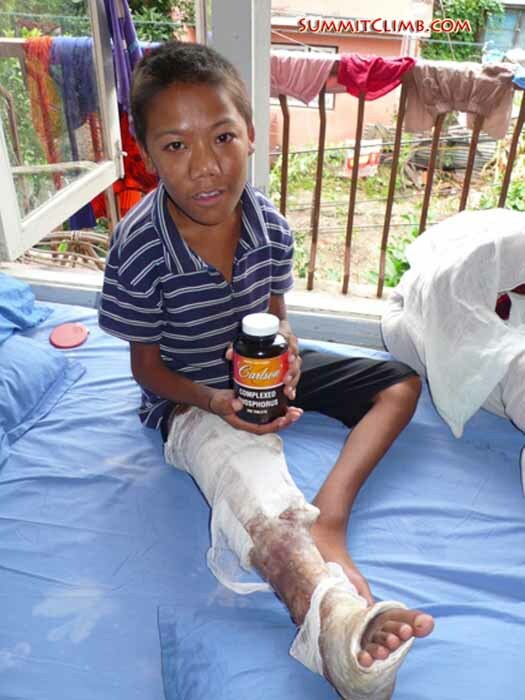 Gavin and Adam went off with lead climbing sherpa Lakpa to go check the recently arrived basecamp food shipment. Ridlon and Ry took the members on a shopping expedition to buy everything they need from the equipment list at SummitClimb's website. We visited three of our key charity/non-profit service projects today. 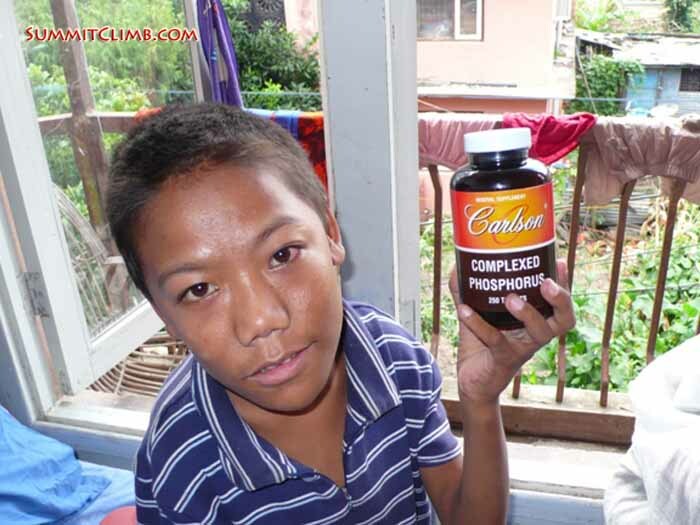 Pasang holding the donated phosphorus tablets. 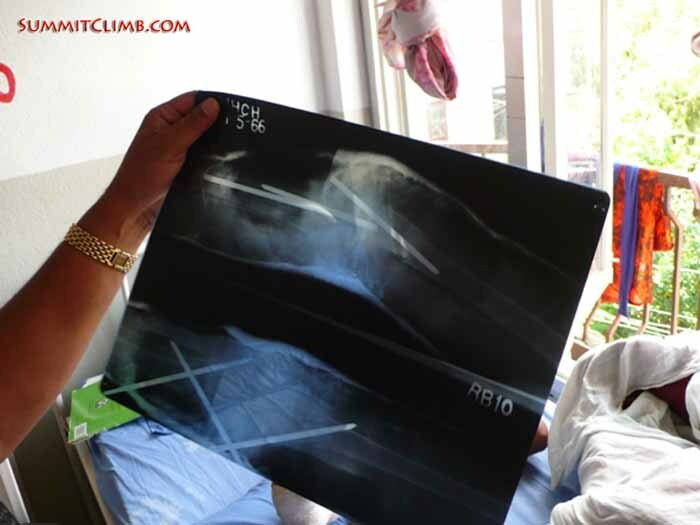 Pasang's x-ray showing the pins in his legs. Pasang after surgery in leg cast (Dan Mazur). Our next foray into trying to help Nepalese people help themselves was a meeting about our 6 year project of rebuilding the Deboche Nunnery with Heather Daniels, an enthusiastic Buddhist scholar. We met at a relaxed second floor café in Thamel and got into the meat of the discussion immediately. 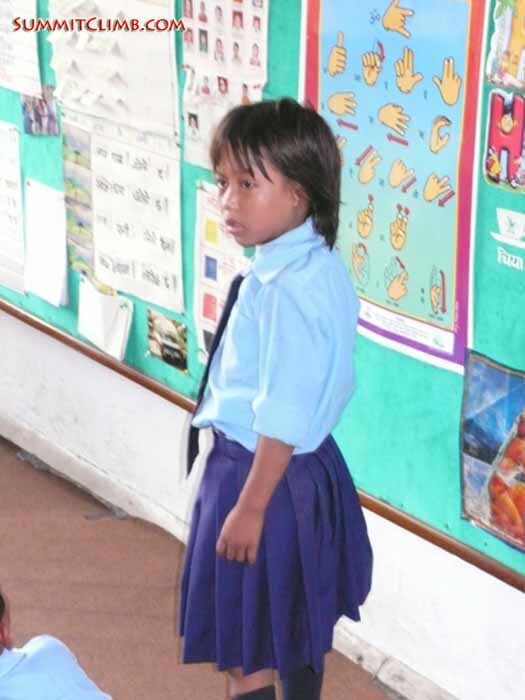 We spoke of our friend Marcia MacDonald and how she has been working very hard to tell the story of the last surviving generation of Sherpa nuns in the Khumbu valley, where Everest is located, now in their 70s and 80s. Not only that, but the Deboche Nunnery provides crucial refuge for beleaguered Tibetan nuns. Marcia has carefully and consistently spread the news about plans to rebuild parts of the old nunnery, bring a fresh water line to the kitchen and develop new nun’s quarters and a retreat centre. The idea is to bring new nuns and foreign students of meditation and Buddhism together, as well as breathe life back into this 80 year old convent. A service trek to dig a waterline from a nearby spring to the kitchen is underway during April 2010, and we urge you and all of your friends to join in. 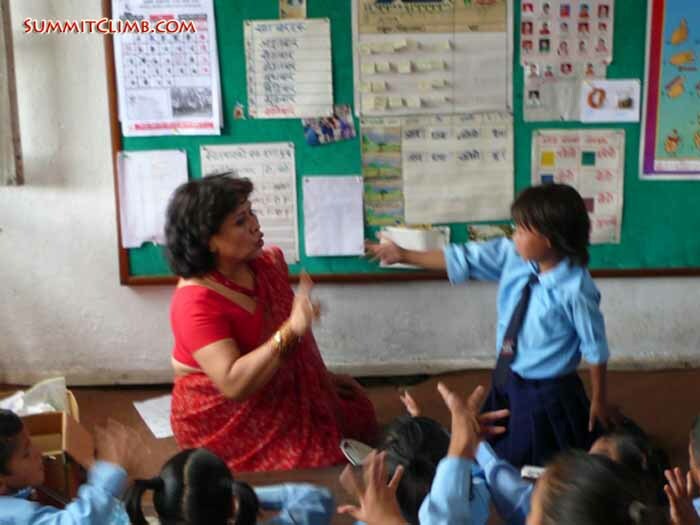 Please tell everyone about www.EverestBasecampServiceTrek.org . For even more info, please do check out www.DebocheNunnery.com . It was fascinating to speak to Heather about her studies and time at the nunnery, and future plans, and we are sending Heather's photo now. 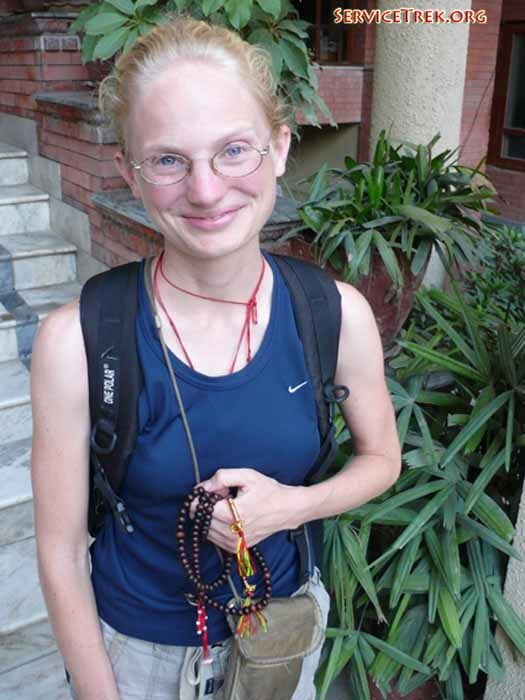 Heather Daniels in Kathmandu (Dan Mazur). 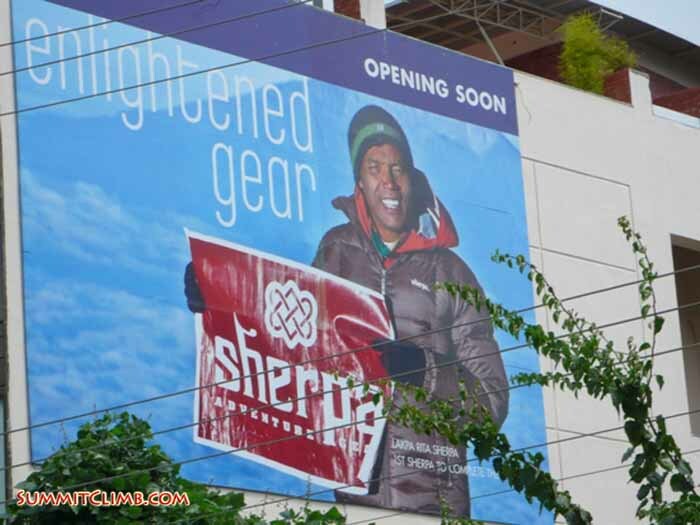 Visiting the new Sherpa Adventure Gear store, which is opening in mid-September 2009 (Dan Mazur). Hi everyone. 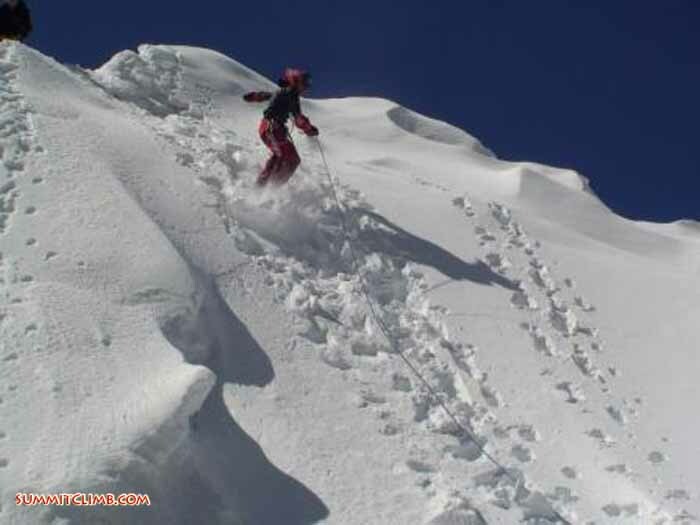 Thanks for checking out Summit Climb News about Cho Oyu and Shishapangma. This is the dispatch for 31 August. Today was a full-on beautiful day. A bit of light mist and rain fell in the early morning, it then became very hot and sunny for the entire day; finally a hard rain came at night. Temps varied from 18 to 29 degrees Celsius, and there was no wind. It’s so clean and beautiful and green here. Kathmandu is at its best, with no tourists and many Nepalis staying at home or out of town, so things are quiet and peaceful. We were busy throughout the day, with an early morning leg stretching walk to the gorgeous "Monkey Temple" atop a nearby hill. A fantastic fitness walk with spectacular views and cultural opportunities where we watched monks praying, locals singing and chanting; and lit some candles and spun a few prayer wheels. We had breakfast at a luxury hotel, then a second breakfast at our favourite café with Abi and Raj from www.SummitTrek.com . Then we went over to the main store room of www.SummitClimb.com and got down to brass tacks with the Nepal director, Murari and our awesome Superstar climbing Sherpas: Jangbu, Thile, Gyelzen, and Lakpa. We tore out all of the equipment and packed all of the tents, cookers, gas, oxygen, walkie talkies, and on and on. It was like a marathon packing session and we got a lot done. We broke for a delicious lunch at a European delicatessen, then went back to the office of www.SummitClimb.com and really went wild on getting the medical kits ready. We sorted out each type of medication, checked the expiry dates and got things extremely organised. Our www.LeaderInTraining.com team has really been pulling out all of the stops and to be honest with you I have never met a group of leaders who worked so hard and I am very proud of them. More members came rolling in today and I met Christian, Wiktor, Ridlon, Carin, Bart, Haris and others. We are becoming a team and that is exciting. Our expedition feels like it is really taking shape. Tonight we went out and had a gourmet Bhutanese meal and sat under a gazebo at a big round table in comfortable chairs. The perfect end to a brilliant day with the www.ChoOyuClimb.com and www.ShishapangmaExpedition.com team. Oh yes, by the way, I met Grace and Carin from our www.ChoOyuTrek.com team and they seemed very nice and had to-the-point questions. I think they will have a great trek up to the exotic and friendly Tibetan Plateau. Thanks to everyone at www.SummitTrek.com for putting it all together. Hi there Summit Climb News readers. I hope you are well and thanks for following our dispatch for 30 August, 2009, for Cho Oyu and Shishapangma on www.SummitClimbNews.com . Today was quite a busy day for us as we prepared for our expedition. We awoke in our comfortable hotel and after a fresh morning rain; the sun popped out and dried out the streets of Kathmandu. I love this time of year here as it’s so clean and the city is so well washed. It’s very quiet and peaceful as locals relax and assume a slower pace of life. Also there are very few tourists here so the normally frantic 'Thamel' neighbourhood is nice and calm. We had a delicious breakfast at our local coffee shop then got to work checking member’s personal equipment and going over the gear list on the SummitClimb.com website. There are three special members of our www.LeaderInTraining.com programme and they have been working very hard getting us ready for the expedition. They are Adam Dixon from England, Gavin Vickers from Australia, and Ry Fable from Colorado. Also in town are two of our expedition members Richard Pierse from Ireland and Alex Macrae from Aberdeen. We went around the "Asan" neighbourhood with our kitchen staff and checked food prices and quality at three different shops, and then returned to SummitClimb’s Kathmandu office to make final purchase decisions. Our food lists and cook staff are looking good, so we will be eating very well. Then we went on to review the equipment lists for www.ClimbChoOyu.com and www.ShishapangmaExpedition.com , and sat with the lead sherpa from each team to discuss every item on the list in detail, so we have things perfectly organised. We are bringing lots of equipment like ropes, tents, radios, medical gear, etcetera, so we are going to be very well prepared. In the evening we met for a delicious dinner at a nearby bistro which serves the most delicious Italian food in a lovely cozy classy atmosphere, then had one nightcap in a nearby pub where we ran into old friends who are in town launching their expeditions to various mountains around Nepal and Tibet. A view of Swayambhunath Stupa, the "Monkey Temple". It is the most ancient and enigmatic of all the holy shrines in Kathmandu valley. Swayambhunath's worshippers include Hindus, Vajrayana Buddhists of northern Nepal and Tibet, and the Newari Buddhists of central and southern Nepal. Each morning before dawn, hundreds of pilgrims will ascend the 365 steps that lead up the hill, file past the gilded Vajra (Tibetan: Dorje) and two lions guarding the entrance, and begin a series of clockwise circumambulations of the stupa. 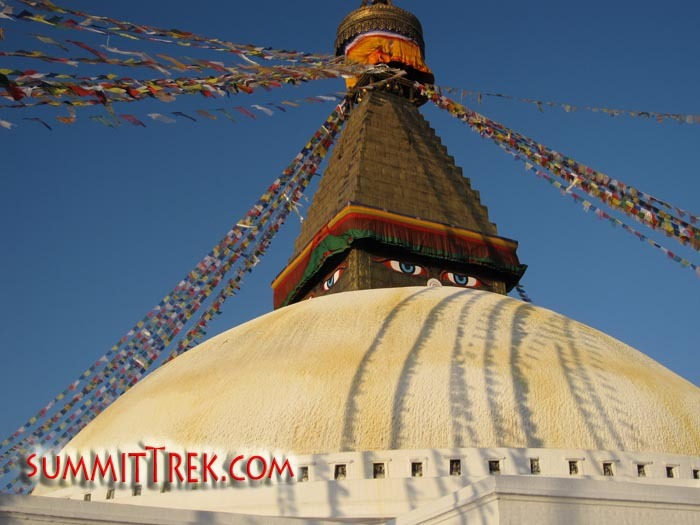 On each of the four sides of the main stupa there are a pair of big eyes. These eyes are symbolic of God's all-seeing perspective (Dave Dogruel). Well, I am in Bangkok airport waiting for our flight to Kathmandu. It seems to be delayed by 30 minutes. I am with two of the amazing sherpas who work with us, Nima and Tsering. We flew here via Seoul, so it’s been quite a long trip with many stops. However, on the plus side, the flight ticket was the same price as ten years ago, so not sure how they do that. It’s fun to travel with sherpas. They are so patient and see things in a much different light than we do. 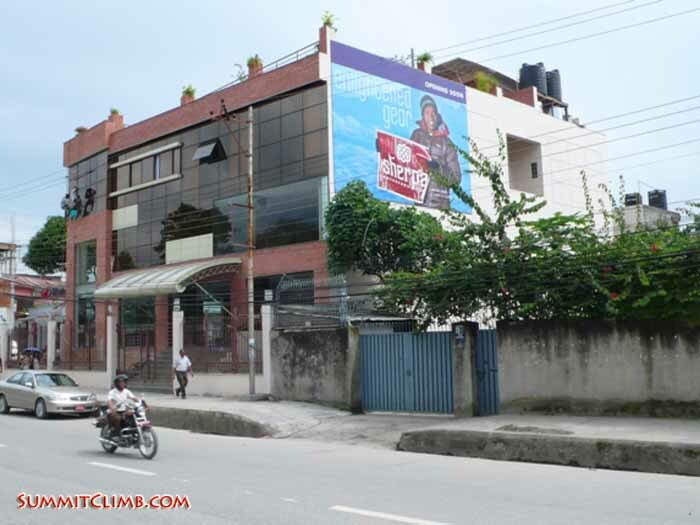 I am very excited to be in Kathmandu this afternoon and get settled into our hotel, have a wash, and get caught up with the entire goings on in our Kathmandu SummitClimb and SummitTrek office. We have scheduled a www.LeaderInTraining.com meeting for tomorrow a.m., and I anticipate meeting everyone and getting going on the packing for our climbing expeditions to Cho Oyu and Shishapangma. We are going to be preparing as well for www.ClimbBaruntse.com which happens 8 October to 14 November and I am looking for a few more people to join me on that exciting trip which includes a free of cost, no charge www.MeraPeakClimb.com . So please tell all of your friends, so you can earn the cash finder's fee we pay for all new members!!! Also we are going to be working on and checking in with several large charity - non/profit projects we have been fostering, together with www.MountEverestFoundation.org , including www.EverestBasecampServiceTrek.org , the Patale health clinic, the Pokhara orphanage, the Deboche Nunnery, and particularly Pasang the boy with fragile bones, Nima the deaf child, and the burned toes baby we want to bring to Kathmandu on this November's www.ServiceTrek.org . We are looking for just a few more members to join our Service treks this autumn and during spring, so please be sure to tell all of your charity - non/profit minded friends.